The design of an extrusion profile has a large impact on how readily it can be extruded. The maximum size for an extrusion is determined by finding the smallest circle that will fit around the cross-section, this is called the circumscribing circle. This diameter, in turn, controls the size of the die required, which ultimately determines if the part will fit in a given press. 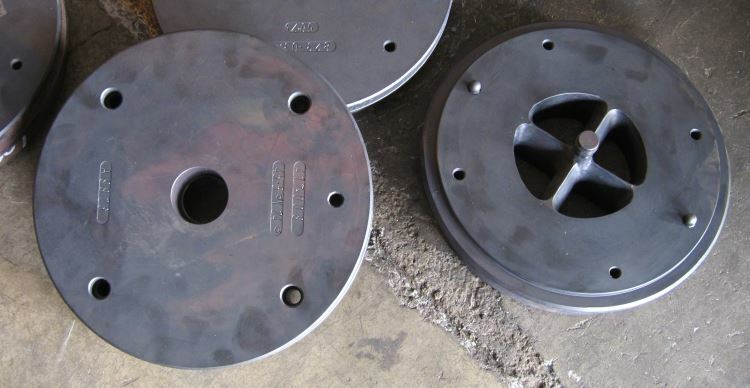 For example, a larger press can handle 60 cm (24 in) diameter circumscribing circles for aluminium and 55 cm (22 in) diameter circles for steel and titanium. The complexity of an extruded profile can be roughly quantified by calculating the shape factor, which is the amount of surface area generated per unit mass of extrusion. This affects the cost of tooling as well as the rate of production. Thicker sections generally need an increased section size. In order for the material to flow properly legs should not be more than ten times longer than their thickness. If the cross-section is asymmetrical, adjacent sections should be as close to the same size as possible. Sharp corners should be avoided; for aluminium and magnesium the minimum radius should be 0.4 mm (1/64 in) and for steel corners should be 0.75 mm (0.030 in) and fillets should be 3 mm (0.12 in).